New dock provides five ports of connectivity for convenient use while on the go. 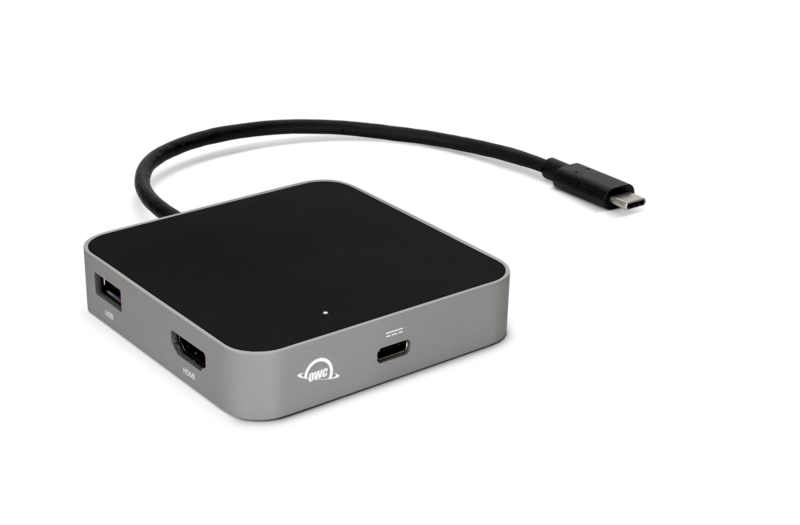 Woodstock, IL — September 13, 2017 OWC®, a leading zero emissions Mac and PC technology company, has added to an already-strong line of connectivity solutions with the new USB-C Travel Dock. Connect the integrated USB-C cable to a computer and utilize five ports of mobile connectivity from a dock small enough to fit in a pocket. The USB-C Travel Dock provides simple connectivity to USB devices through one USB Type-C integrated cable. That cable gives connectivity to five ports and the USB devices users need when on the move. The HDMI port connects one 4K display, so there is no need to worry about insufficient quality or connection when creating and presenting on the go. Two USB 3.1 Gen 1 Type-A ports connect and power two USB devices, so users can have a full tablet or phone charge at all times. An SD card slot allows users to access and store photos with one easy connection. The new dock gives mobile users unmatched connectivity. For the traveling professional, there is no longer a need to carry multiple chargers or find an adapter for a presentation. Students no longer have to attempt to fit a laptop, along with multiple chargers and USB devices, into a backpack. Tech savvy end users can easily connect a notebook to a monitor, wireless keyboard and mouse, as well as charge a smart device. Available in Silver, Space Gray, Gold, and Rose Gold, the OWC USB-C Travel Dock gives mobile users connectivity where and whenever it is needed, in a form factor that can be held in hand. Available for shipping now, the USB-C Travel Dock gives the creative pro, traveler, student and tech-savvy end user the connectivity capabilities they need, when they need it, where they need it to connect to a mobile USB world. Get social: follow OWC Facebook, Instagram, and Twitter.